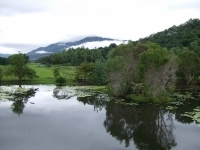 The name 'Tjapukai' means 'people of the rainforest' and refers to the indigenous people who have inhabited the tropical region between Cairns and Port Douglas, and inland to Kuranda, for eons. About 20 years ago a group of entertainers established Australia's first aboriginal dance theatre at the village of Kuranda, near Cairns, in a shopping centre basement. Its popularity with tourists led to expansion into a fully-fledged award-winning 25-acre Cultural Park, which now draws the crowds at Smithfield, a few miles north of the city. Show business, in the form of history and dance theatre, remains the basis of the attraction, and at the Camp Village visitors can interact with the Tjapukai and try out traditional activities like playing the didgeridoo and throwing a boomerang. The park also offers a night-time show experience where the audience is swept up into the ancient rituals and ceremonies of the 'Dreamtime', including fire dancing and a dinner banquet of local food and wine.